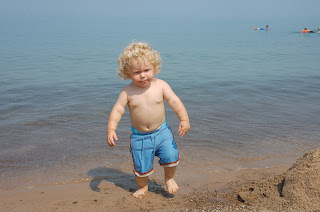 meredith and i took owen to the beach today. as you know, owen loves sand. i really dont get it, i mean come on, how good could sand really taste. it's just too gritty for me. we had a great time and i added to my crispyness by getting fried on my back. ahh, the sacrifice of wanting a good tan so you can really say to people "look, i was on vacation, dont you see my new tan?" to make the day complete, since we were only at the beach for a few hours, meredith and i left owen with my grandparents and went and spent our husbands well earned money. well... ok, meredith spent her own hard earned money... and i spent brians. though, i do care for our son... at the beach. it's tough sitting in sand and that definitely deserves an hourly rate.